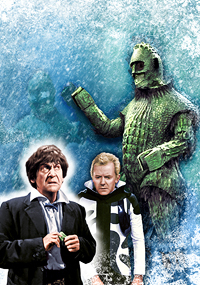 For a 1960s story there's a surprising number of colour photos from 'The Ice Warriors' - and apart from a few of the Doctor, all those of the eponymous creatures show that first attempt at a helmet that, frankly, I think looks blooming awful. That head-bloated, 'grinning' Ice Warrior is probably the most seen image of the Martians ever thanks to the colour shoot during filming at Ealing, whereas photos of the 'proper' helmet are limited to a few black-and-white shots. Of these I had anticipated using the very familiar one of Varga in classic arm-waving pose - think of Chris Achilleos's Target book cover and you'll know the one I mean - but all the copies I could find were very dark, and in fact it didn't fit my cover layout as well as I'd expected. Much better quality was a shot of Varga and Victoria in the Britannicus Base storeroom which fitted neatly in the space to the right of the cover logo. I manipulated him a bit to raise his head a tad as he was slightly looking downwards at the diminutive Victoria originally, and to bring his right arm up into a more threatening pose. I considered having his lower half still encase in ice, with chunks flying apart as his top half worked loose, but I couldn't get the effect to work convincingly and, knowing the foreground figures would cover up much of the Ice Warrior's legs, decided it wasn't worth pursuing. Instead I created layers of distorted reflections and shadows in the ice wall behind him to suggest he was still pressed into it, while at the last minute I added a second Warrior still frozen inside the glacier which, while covered by the title on the final cover, filled in a space on the clean artwork. The only decent photos of the Doctor from the story have him in his iconic pose twiddling with the oscilloscope, which I'd already used on 'The Seeds of Death', so I had to look at surrounding stories instead. There seem to be few photos of Troughton from Season 5 so I had to resort to one from 'The Dominators' but the pose and expression fitted the layout well, with Varga looming above him. It needed a second foreground figure, however, and although there aren't really any villains in the story, Clent comes closest - being the stock base-commander-who-can't-quite-take-the-pressure - and at least got some photo coverage. And so I thought I'd done my last Second Doctor cover, at least while I decided if and how I was going to do versions for the CD soundtrack releases, when they only went and discovered two more previously lost stories! Great news, but just when I thought I was getting near the end they move the finish line. So 'Enemy of the World' will be coming hopefully fairly soon (I have a layout in mind), with 'The Web of Fear' to follow. Although as these releases don't appear to have anything in the way of extras, I might have to adapt the back cover slightly.